Charming decor with fine materials. Delicious menus, and two daily excursions with qualified naturalistic guides. 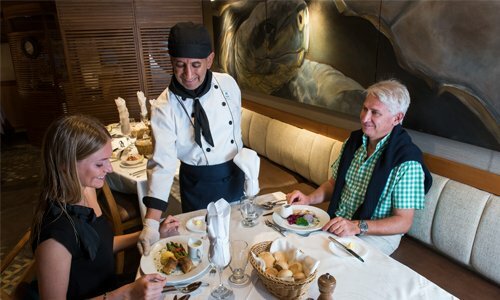 An All-inclusive Galapagos Cruise experience on board of this comfortable and luxurious boutique expedition ship is the perfect way to explore this unique destination. Its refreshed ambiance can accommodate 100 passengers, offering high-quality services and various activities in its spacious open decks. Two daily excursions are offered with optional activities such as snorkeling, diving, and kayaking. Orcas in the Galapagos is one of the fascinating displays when exploring the archipelago. This unique experience usually takes place in the west, between the islands of Isabela and Fernandina, where the water is a source of abundant food due to the colder currents’ that produce upwelling. The best months to spot whales are between July and November in our itinerary B West. Experience the islands, wildlife, and culture of the Galapagos. Its pristine terrestrial and marine ecosystems, amid captivating landscapes, are a sanctuary for the most wonderful land and sea creatures. The unique characteristics of these islands (isolation, weather, ocean currents, geology) created the perfect natural conditions for them to become a “living laboratory of evolution”. Islands and beaches of all colors, cliffs and stunning geological formations, bays and coves lapped by very rich ocean waters. With unique landscapes and magical corners, each of the islands has its own character. The Galapagos Islands are a natural sanctuary of pristine land and marine ecosystems isolated in the vast ocean. Visiting them is like being transported to a bygone era. The islands where their unusual high percentage of endemic animals (animals found nowhere else on the planet) will captivate you with their truly unique and fascinating forms, behavior and fearlessness. Animals that after arriving from far away distances have evolved to create new species, and will teach you what it means to adapt to a change. They were, in fact, Charles Darwin’s inspiration for his Theory of Evolution. Throughout the years, Go Galapagos has adapted to the necessities and changes of the tourism industry and this is why, nowadays, it is one of the top tour operators in Ecuador. It has focused to maintain high service standards, as well as, a sense of protection in the complex environment of the Galapagos. The company´s goal is that travelers´ take back lifetime memories and experiences from the islands. Magnificent open deck areas to relax and socialize. In the tourism operation industry. Two excursions per day guaranteed. More than 69,032 happy customers.